No. 1 on the list was 2002's "Ballistic: Ecks vs. Sever"
(CNN) -- "Ballistic: Ecks vs. Sever" had few fans upon its release in 2002. The $70 million movie, starring Antonio Banderas and Lucy Liu, was a box office failure, making just $14.3 million domestically and less than $6 million overseas. 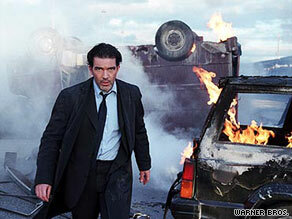 Antonio Banderas, above, and Lucy Liu starred as dueling secret agents in 2002's "Ballistic: Ecks vs. Sever." And critics were scathing. "A career low for both Liu and Banderas," said Empire magazine. "Ecks this one off your must-see list," wrote the New York Post's Lou Lumenick. With the aughts winding down and September traditionally a rough month for movies, Rotten Tomatoes decided it was a good time to update an old list of bad movies and look at some of this decade's worst, said Matt Atchity, the site's editor-in-chief. "We've seen some really, really poorly reviewed movies in the last few weeks," he said. "That kind of made us think ... to update this list and focus on the last 10 years." "Ecks" received a unanimous thumbs-down, giving it a 0 percent Tomatometer rating. Thirteen other movies in Rotten Tomatoes' horrible hundred also had zero good reviews -- including 2002's "Pinocchio" (the Roberto Benigni version) and 2004's "Superbabies" (directed by "Christmas Story" auteur Bob Clark), but no other movie came close to "Ballistic's" expansive perfection: 107 reviews, none good. Atchity said it's rare for a movie to pick up a goose egg on the Tomatometer. "Usually some [reviewer], somewhere, likes something," he said. Besides, Atchity added, it's all relative. Though the oeuvre of Jason Friedberg and Aaron Seltzer -- the makers of critically reviled parody films such as "Epic Movie" and "Meet the Spartans" -- included four movies on the worst 100 list, their films routinely do well at the box office. Still, Atchity defends the role of movie critics, themselves much reviled (and, given the struggles of newspapers and the rise of social media, much unemployed) in recent years. Critics may not be able to doom a bad movie, but they can give a boost to small good ones -- and they keep a dialogue going about movies in general, he said. "I think that criticism in this day and age becomes even more important, because you can't, as a moviegoer, let the studio's marketing arms dictate what you're seeing," he said. "I think it's important as a society that we be discussing the art we're consuming." Which brings us back to "Ecks vs. Sever." Could it be an overlooked classic? "It's pretty bad," Atchity said.